Many financial services firms have automated the vast majority of key processes and customer experiences. However, the “last mile” of most transactions – completing the agreement– far too often relies on the same inefficient pen-and-paper processes of yesteryear. 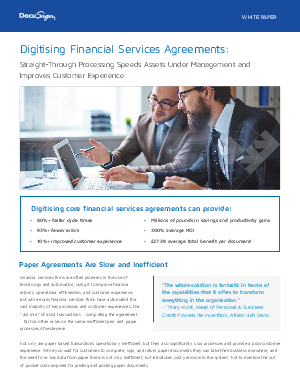 Digitising agreements using DocuSign lets you keep processes digital from end to end. Completing transactions no longer requires documents to be printed and shipped, and re-keyed on the back end.